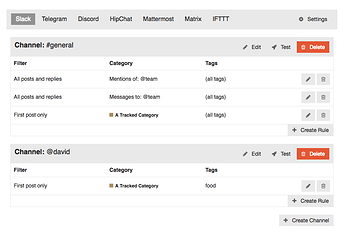 discourse-chat-integration is the product of my Google Summer of Code project with Discourse. It allows sending notifications about new Discourse posts to ‘group chats’ on a number of instant messaging platforms. It is based on, and aims to supersede, the existing discourse-slack-official plugin. Provider: An external ‘instant messaging’ provider. See the list above for examples. A provider can contain multiple ‘Channels’. Rule: The plugin checks the list of rules for each channel when deciding whether to send a notification about a new post on Discourse. It can get confusing when you have lots of rules, so make sure to check the information below! The site setting “chat integration discourse username” allows you to secure your notifications against leaking private information. By default the system account is used, which means that there is no restriction on notifications sent. To secure your notifications you should create a non-staff user with appropriate access privileges, and enter its username in the site setting. If you have “Slash Commands” enabled for your provider, and do not trust every member of the external “Channel”, it is absolutely essential that you set this up to avoid them having access to private categories on your forum. If your provider supports slash commands, you can manage rules from within your chat interface. Each provider varies slightly in syntax, but in general they follow a similar structure. If your provider supports transcript posting, you can post your instant messaging history to discourse. This is currently only supported for the Slack provider. Note: You will need to be using the “Access Token” method of connecting to Slack. Send /discourse post to see the interface. The plugin will try and “guess” where your current conversation starts, by looking for a gap in the message history of more than 3 minutes. Alternatively, you can specify a number of posts after the command, or a URL to the first message. It is possible for third party plugins to register new “providers”. As an example, I’ve created a provider which sends webhooks to IFTTT. This could be used to automatically publish all posts in a category to facebook… or turn on your light when someone posts in #feature… or feed your fish whenever there’s a new #plugin. Will Rocket Chat and others get transcript posting? Does Discourse have a chat room function? Can Discourse Integrate with Free Slack? Can you enable a plugin that integrates slack and discourse? Plugin for auto posting to social media? Please post replies to the #plugin:chat-integration category. Would it be possible to add support for including ALL subcategories under a category? I have an install that has hundreds of subcategories with new ones added daily, but no notifications are sent unless I add every one of those categories as a rule. I also have been bitten by handling the plugin the categories not in a recursive manner: having just 2 private categories and muting the main secret ones, I got notifications from subcategories. Suggestion, disable display full name on discord message if the forum have “enable names” disabled. I imported users from other forum CMS and has this display name wrong, the plugin needs to check this option, I think. full_name = post.user.name || ""